So I have another kid now. 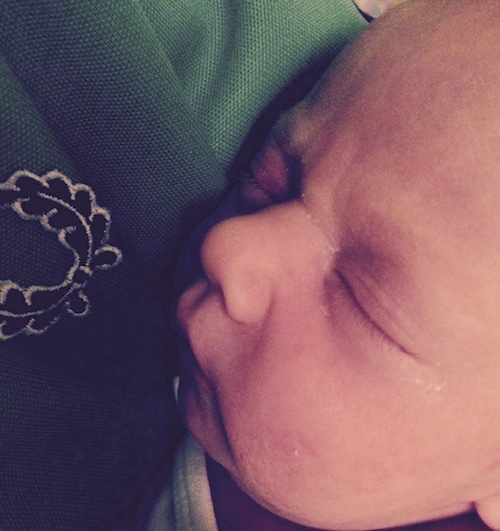 My daughter, Vera Frida M. Pentland, was born on December 27, 2014. She goes by Frida, as far as we can tell. She barely responds when we say her name, preferring instead to either sleep or eat, basically ignoring everything else. If you threw in an Xbox and a bag of chips, she’s pretty much just like her older siblings. Her mother took her sweet old time having her too, clocking in at 56 hours of labour, including making me drive her all over town at all hours, from home, to birth centre, to a hospital. Needless to say, things didn’t go according to our birth plan, but everything worked out in the end, and one month later baby and mom are doing great. So now I officially have three kids. It’s been almost 8 years since the last one was born, and while some things are coming back to me (the quick-change diaper maneuver, opening a bottle of wine with one hand while rocking a baby with the other), some things have definitely changed. For instance, it seems that strollers are actually made to be harder to open as time goes on. When I was a baby, they didn’t fold up at all. When my son was born 11 years ago, it was a flip and a slip and a bang and you were on your way. Now I seem to have missed the classes needed to operate the damn thing at all, and practice does not make perfect in this case. The brake seems to always be on, and the beer holder attachment barely fits a take-out coffee cup. Not only is the stroller a puzzle to fold and unfold, but it comes with a bassinet that somehow attaches to it, and that my daughter hates, if her screeching is anything to go by. In fact, she doesn’t seem to like travelling at all, unless it’s in my arms and my back is about to give out. With my other two kids, the only time they would nap was if I was driving them around, usually on the highway, at great financial cost given the price of gas at those times. Now gas is crazy cheap, and this one hates being in the car. My older kids have been great with the new addition, and are constantly eager to hold her. Neither of them are eager to change her, however, just as they both physically gag if I ask them to take the dog out in case she poops and they have to pick it up. I’ve even said they could use a plastic bag on their hands, but still it’s a no-go in both cases. Nevertheless, the three of them are getting along – or at least the two older kids are getting along with the new one. They are definitely not getting along with each other, but that is a given, and something that we have been trying to figure out. With a new addition comes new rules, or new ways of handling things. Trying to get the older sibs to pitch in a little bit more, but not making it seem like their lives have become so much worse with a new sister, is the goal. It could be very easy for them to see the baby getting all the attention, and their stepmother and I have been trying to make sure that they are involved in things, despite the fact that “things” right now involve a lot of poop and spit-up – from the baby, let’s be clear. For the record, I take care of my own poop and spit-up. We have allotted them some new chores, simple tasks like making their beds in the morning and picking out clothes the night before. This was met with the expected outrage and venom, as if asking an 11-year-old to feed a dog every morning is tantamount to making him rebuild a car engine blindfolded. Hopefully this new world order will stick. I’ll let you know how it goes. The Obligatory (now) Bi-Annual Post. Long time no blog – plus 9 THINGS MY KIDS DO THAT DRIVE ME CRAZY! !